Routine lab tests are recommended before beginning treatment of high blood pressure to determine organ or tissue damage or other risk factors. 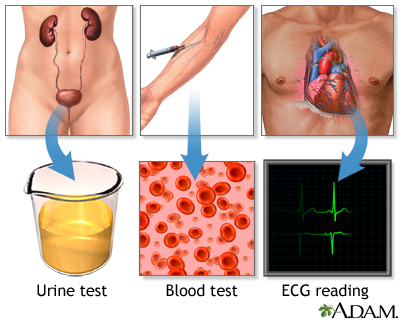 These lab tests include urinalysis, blood cell count, blood chemistry (potassium, sodium, creatinine, fasting glucose, total cholesterol and HDL cholesterol), and an ECG (electrocardiogram). Additional tests may be recommended based on your condition.